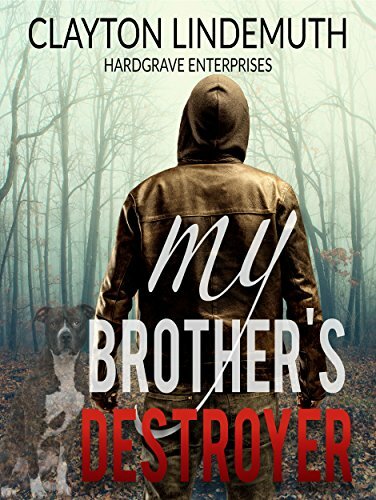 Article first published as Book Review: ‘My Brother’s Destroyer’ by Clayton Lindemuth on Blogcritics. “My Brother’s Destroyer” by Clayton Lindemuth is a thrilling story with intense, horrific drama, displaying the ultimate depths of pure evil, and the lengths one man will go to for vengeance. As the result of an incident with his brother early in life, Baer Creighton acquired the uncanny ability to detect when people are lying – his eyes see red and he experiences physical pain. This uncharacteristic attribute, combined with his lack of faith in the general goodness of people, finds Baer spending most of his time at his home in the woods, focusing on distilling his highly sought after moonshine. His only companion is Fred, his pit bull. Fred is stolen one night and forced to fight in an illegal fight circle, sponsored by Joe Stipe, the local thug, and attended by some of the more prominent citizens of Gleason County, including the police chief, the pastor, and Baer’s own brother, Larry. When Fred is left for dead, Baer knows he is on his own if the issue is going to be set straight. Things get out of control fast as tensions on both sides escalate, and Baer, in a seemingly hopeless situation, must reflect on some painful memories from the past, in order to carry out his need for retribution. Fascinating story! This tale was gripping from the very start with the author’s enthralling writing style pulling readers into the drama on the first page. There are no fillers in this story – I found every word impactful and necessary to move the plot along at a swift pace, filling me with unsettling, yet somehow satisfying tension and anxiety, as I eagerly tried to get into Baer’s head. Written in authentic dialect, the tone is unique and impressive, a multi-dimensional experience transporting readers directly into each scene. The characters are genuine and full of depth, with real struggles. With no tip-toeing around issues or personalities, they will compete for your emotions. Good or evil – love them or hate them, these characters will pull at your heart and imprint your mind. Strong feelings and emotions about every single one of them will ensue - guaranteed. I highly recommend “My Brother’s Destroyer” by Clayton Lindemuth. His distinct writing style, with a unique blend of humor, sarcasm and darkness, will appeal to readers of thrilling suspense and horror and those that love a strong-willed protagonist on a mission. Loved this story!